Yes that dreaded end of the summer is looming closer. 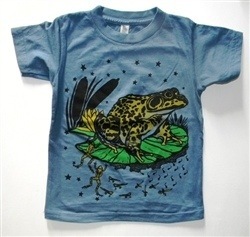 Kids are going back to school soon, and most of them will need some new clothes. Appaman has got you covered with some great new styles that will help your boys have an awesome new school year. Atoms Classic Tee by Appaman: this blue galaxy colored long-sleeve tee is perfect for the changing weather of fall. 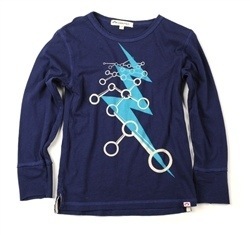 It features a great screenprint of a lightning bolt and atoms. 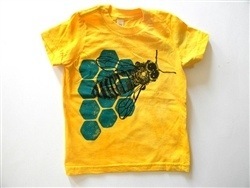 Boys will love the cool screenprint and the awesome color. 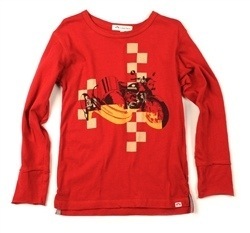 Sidecar Classic Tee by Appaman: this red long-sleeve tee will blow away all the competition for coolest tee at school this fall. 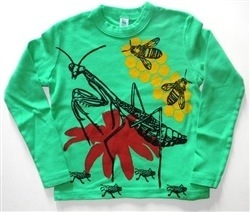 With its motorcycle and sidecar screenprint boys will think it is fire hot and fast. 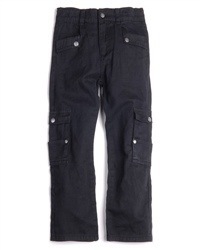 Cargo Pants by Appaman: boys love cargo pants. There is something about having multiple pockets to stash cool things in that just impresses boys. These cargo pants are great because they not only feature a lot of pockets they also feature awesome silver closures to keep all those cool things safely inside. With all the fun days of summer coming quickly to a close it can be important to make going back to school seem fun and exciting. One of the ways to do this is to give the boys something fun to look forward to, and what is more fun than putting on new clothes for the first day. Any of these great looks would make great back to school looks, and Appaman has many more awesome looks available now, so check them out at The Boy’s Store for great back to school styles. This entry was posted in boys clothing, Brand News, Featured item and tagged Appaman, Back-to-school, new looks, new styles, the boys store on August 13, 2013 by Lacy.